From the freshwater streams and rivers of the Upstate to the coast of the Atlantic Ocean, South Carolina offers a unique fishing experience for the entire family. Take part in new and exciting fishing adventures. Explore the Palmetto State’s beautiful waters and make memories that will last a lifetime. South Carolina’s mountains, midlands and coast are all within a short driving distance, so you can fish all three regions in a single weekend. At 41 miles long and 14 miles wide at its widest point, Lake Murray covers 78 square miles with 649 miles of shoreline. Some of the best fishing you will experience in South Carolina is guaranteed to take place on the waters of Lake Murray. Covering 50,000 acres and bordering four counties, this expansive lake offers plenty of spots to drop a line. From the freshwater streams of the mountainous Upstate to the shores of the Atlantic Ocean, your next South Carolina fishing adventure awaits. 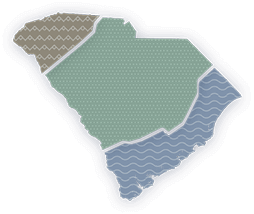 Whether you're a resident of South Carolina or just visiting the state, be sure you have a current fishing license. Whether you are a first-time angler who wants to learn, or an age-old pro looking to catch dinner, you can check out fishing equipment from one of several South Carolina Fishing Tackle Loaner Program sites. Escape to the salt flats along South Carolina’s coast and discover why the Lowcountry is known as a fly fisherman's paradise. There's no better view of South Carolina’s Lowcountry salt flats than from the platform of a flats boat, where the knowledge of a local boat captain is invaluable. Plan an exciting outdoor adventure at any of these great fishing spots in South Carolina. Get the most out of your South Carolina fishing adventure by casting a line at any of these top fishing piers. Take your next South Carolina adventure to new heights at Devils Fork State Park. Plan your next outdoor adventure at Santee State Park, one of South Carolina's premier camping and fishing destinations. Fish for bass, trout and deepwater catfish and see for yourself why Lake Jocassee is one of South Carolina's premier freshwater fishing destinations. The flats and backwaters of South Carolina’s Lowcountry are the ideal destination for any angler. Embark on the fly fishing adventure of a lifetime as you enjoy the scenic waterways and breathtaking views of the Palmetto State. Plan a visit to Santee State Park and discover why it’s the perfect place for an outdoor adventure. From boat tours around South Carolina’s largest lake to fishing just a few feet from your front door, Santee State Park is an outdoor enthusiast’s dream.